From starting the day with a bowl of iron-rich Gerber Infant Cereal to playing peek-a-boo, these are the things that I do daily to help boost my baby's brain development. I can't believe that my little guy is already 10 months old. 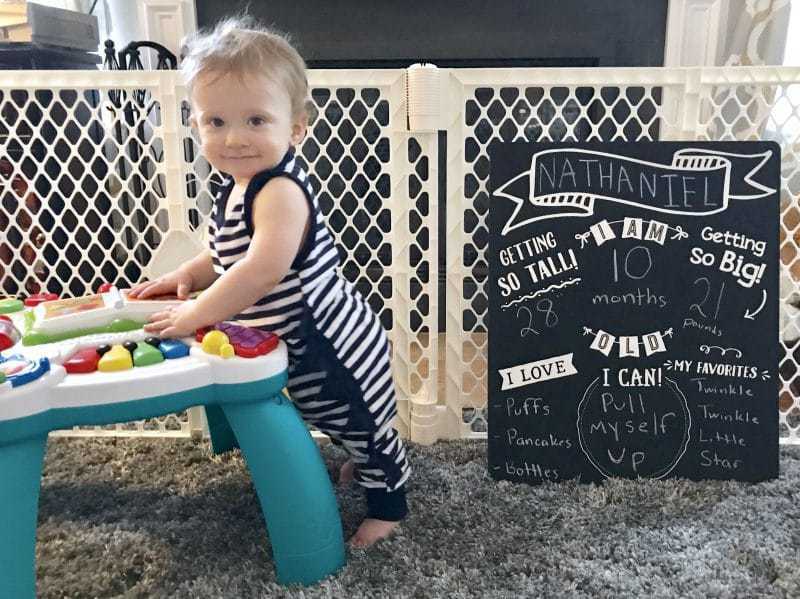 It seems like just yesterday we were bringing Nathaniel home from the hospital, and now he is already pulling himself up and walking around while holding onto things. It seems like he is hitting new milestones everyday. I have been so happy with Nathaniel's development. He is growing from a tiny baby into a big, strong, smart little boy. There are several things that I do with my little guy each day to help boost his growth and brain development. Today I will share 5 of these brain-boosting activities. Growth and learning require proper nutrition. Iron is a nutrient that is especially vital to baby's healthy brain development. While babies are born with a natural store of iron, it starts depleting when they are around 4-6 months old. 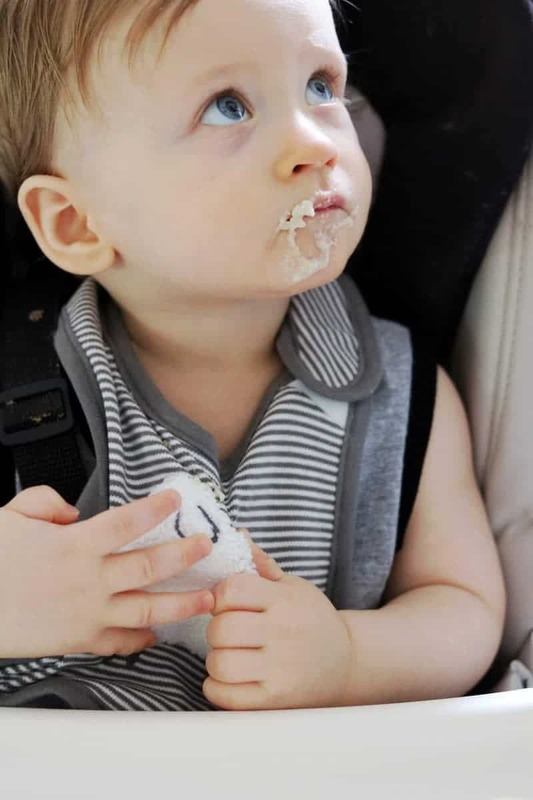 That is why starting infants on an iron-fortified cereal starting at 6 months is so important. You're doing it wrong little guy… you have to wait for mama to feed you your cereal! 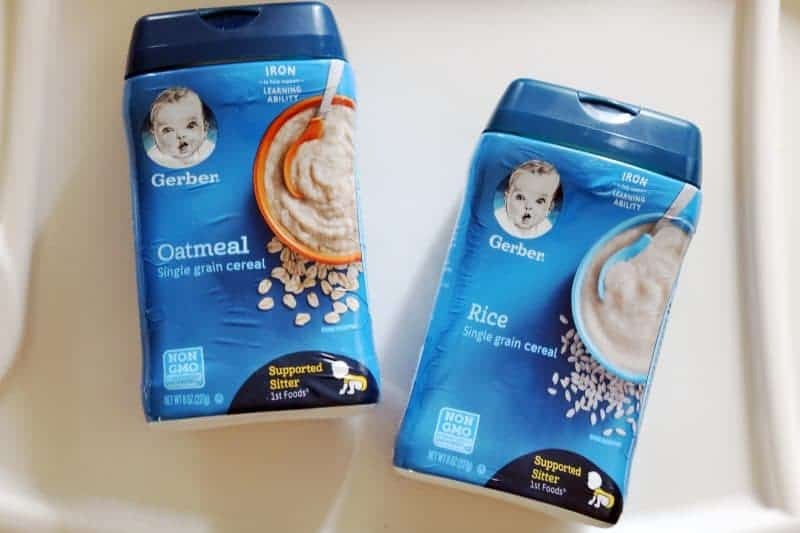 I take my little guy's nutrition seriously, which is why I feed him Gerber Infant Cereal every morning. 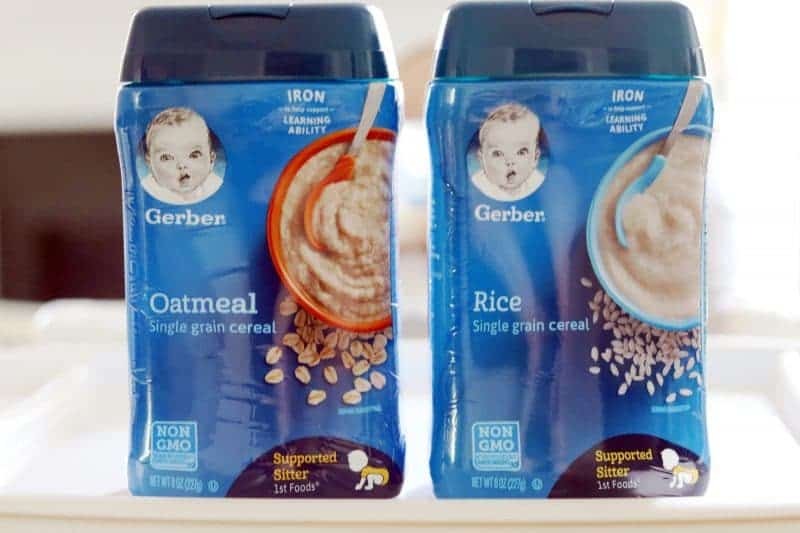 Gerber Infant Cereal is packed with iron. 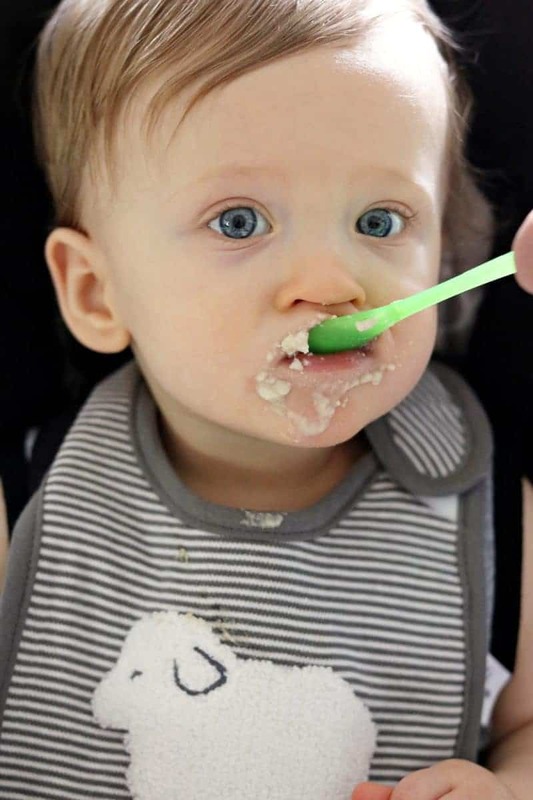 Just 2 servings of the non-GMO cereal gives babies 100% of the iron that they need each day. 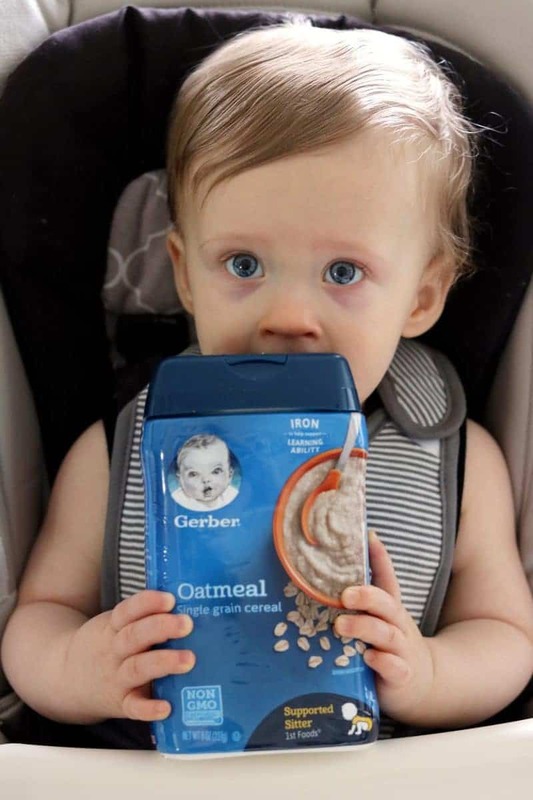 Along with brain-boosting iron, Gerber Infant Cereal provides babies with a variety of other essential nutrients such as Zinc, Calcium, Vitamin C, E and six B Vitamins. And it doesn't hurt that Nathaniel loves his bowl of Gerber cereal each morning. 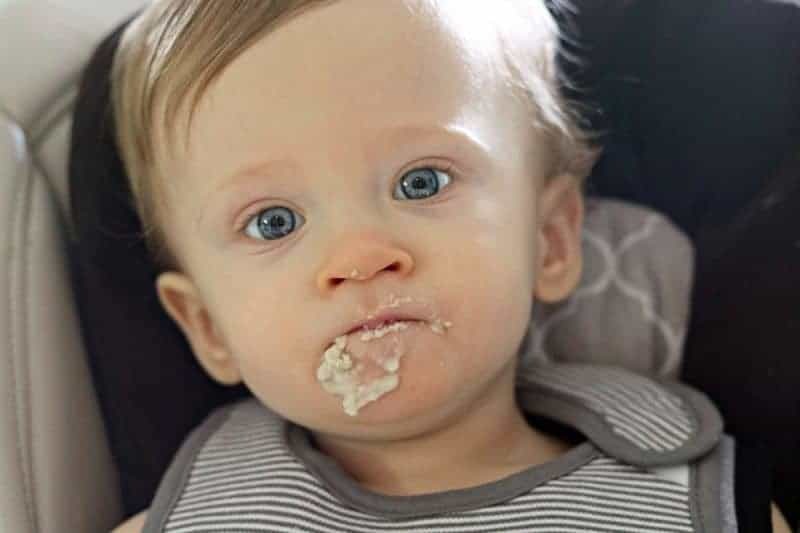 Whether it's a bowl of Gerber Single-Grain Rice Cereal or Gerber Single-Grain Oatmeal, he eagerly eats up each spoonful I feed him. 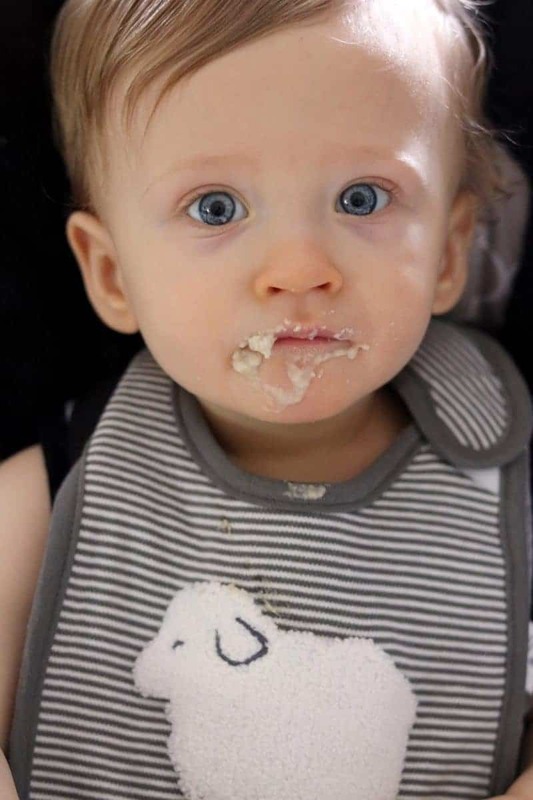 Since Nathaniel first began eating solid foods, he has started each day with a bowl of Gerber cereal. I believe that starting the day with a nutritious breakfast helps set him up for a day of learning and development. Nathaniel and I play spontaneous games of peek-a-boo throughout the day. I hide behind anything I can find — from my hands to a door. He loves the anticipation of seeing me pop back out from wherever I am hiding. He has recently even begun to take the lead and hide himself by pulling a blankie up and down over his face. It is too stinkin' cute. Sometimes we a little hide and seek with his toys as well. For example, I place his ball — with him watching — under a blanket or behind my back and ask, “where did your ball go? !” At first I would have to leave a little bit of the the toy I am hiding sticking out to make it easier for him to find, but now he is getting the hang of it and is able to find the toys without them sticking out at all. At Nathaniel's baby shower we asked guests to bring a book instead of a card. Thanks to all of our wonderful shower guests, Nathaniel has quite the library of baby books. He often grabs at the book and wants to look at it on his own, and I let him. I'm just glad that he likes his books. Hopefully, this will build a love for reading in the future. Whether it's bath time — Nathaniel's fave — or he is just watching me do boring household chores such as washing dishes, I try to keep it fun and interesting by singing. Sometimes I sing actual nursery rhymes but other times I sing made up rhyming songs about what we are doing. “Rub-a-dub-dub, Nathaniel is in the tub” is one of my personal faves. But let me tell you: nothing is as exciting as a song about folding laundry. Or changing a dirty diaper. Nathaniel is mama's number 1 fan. He never complains no matter how badly I sing and he seems to really enjoy all of my songs. When Nathaniel babbles I respond. If he shouts I ask him, “What's wrong Nathaniel? !” If he says “blaaaadadama” I respond with, “Oh really?! Then what? !” or “You did?! When? !” This begins a back and forth conversation of him babbling and me responding. Even though his sounds may not be words, I can still show him that what he says matters, that I am listening, and that I want to talk to him. Wait, what kind of question is that? Of course you do! Target is the best, right?! I love how I can pick up my groceries, home goods, and some new outfits for the little guy all at one store. Plus, I always make sure to stop by the Target Dollar Spot at the front on the store. The Dollar Spot is full of great deals on cute seasonal items! 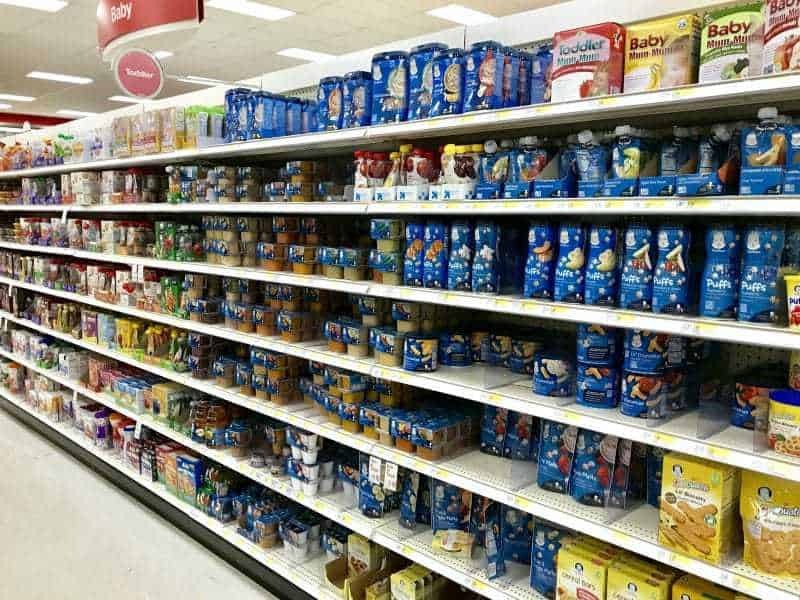 Save on any Gerber Cereal at Target by using the Cartwheel app to redeem! Get the valuable Cartwheel offer here. 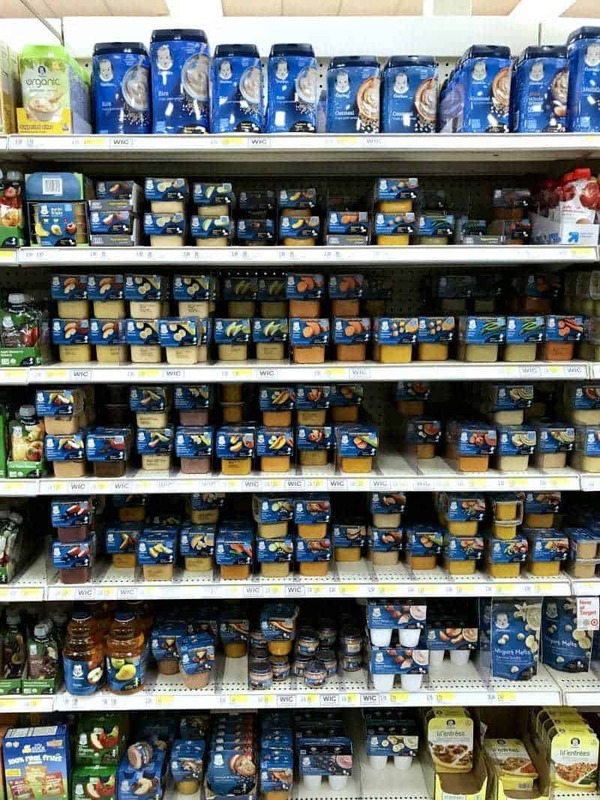 You can find Gerber Infant Cereals at Target in the baby food aisle in the Baby section. Side note: This past trip to Target was Nathaniel's very first time sitting in the shopping cart like a big boy. I usually bring in his stroller or just pop his entire car seat in the cart. But I decided it was time for him to ride like a big boy. 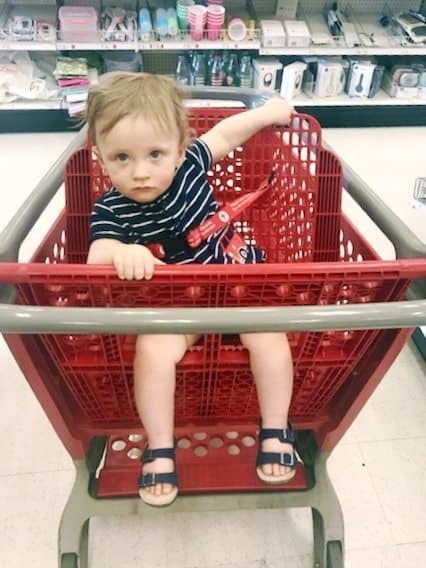 I love that Target's shopping carts have a strap to secure him in the seat — unlike some of our other local stores. Nathaniel loved people watching and to get this new view of the store for up in the seat… even though he held on with both hands the entire time! 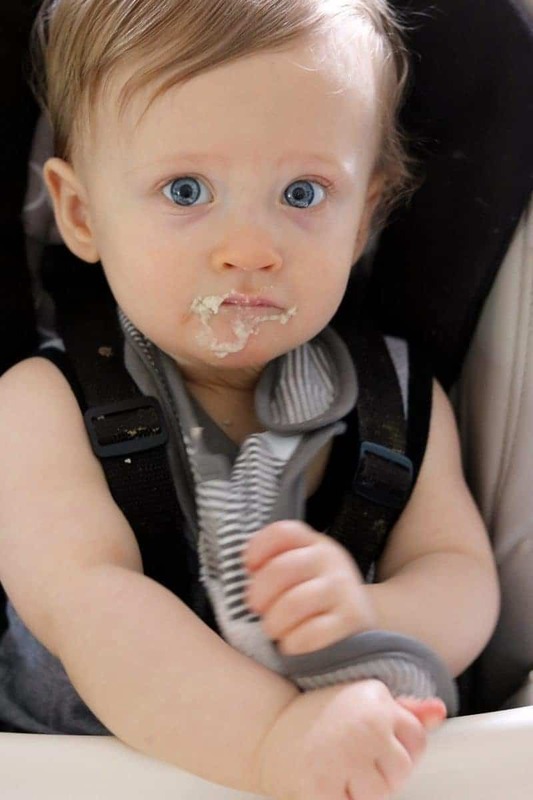 He looks like he enjoys his Gerber, lol. I didn’t realize iron was important to brain development. Thanks for posting! 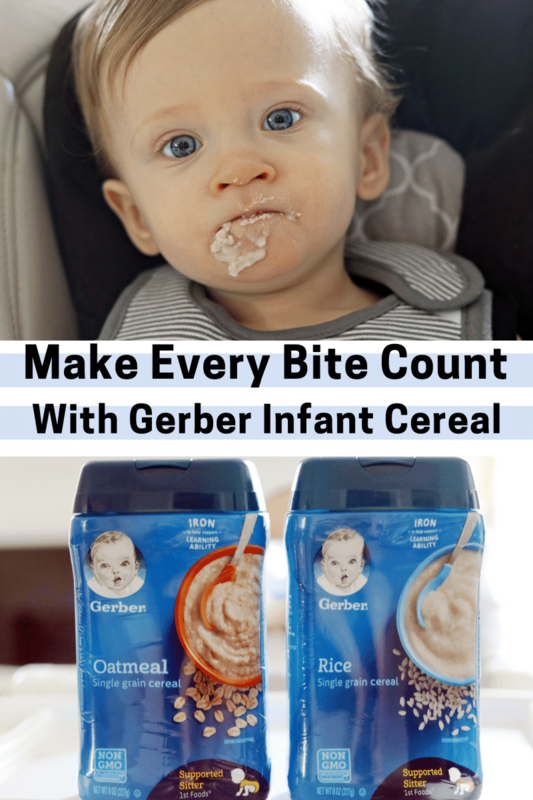 I fed my daughter Gerber when she was younger and she loved it! Gerber hass been around for a long time, that says a lot!